Frederick Ernest Chick was born in April 1892 in St George’s Hanover Square. Fred’s father Henry, a Milkman, died whilst he was still a child. By 3 November 1898 he was admitted to Britten Street Old & New Workhouse, Chelsea, aged 6 along with 2 brothers and a sister. Life in a Victorian workhouse was deliberately harsh, to supposedly deter the able-bodied poor and to ensure that only the truly destitute would apply. Fred and his siblings must have been in a desperate situation to take this hated and feared option but with no father there may not have been a choice. It was usual practice for workhouse children to be given training in a trade so they could make a living as adults. Around the turn of the 20 century Frederick Chick had moved south of the river and by 1911 was a spectacle frame maker working for an optical lens company and living in Christ College Working Boys Home, 111-113 Camberwell Road, Camberwell. It was around this time he joined Charlton Athletic. 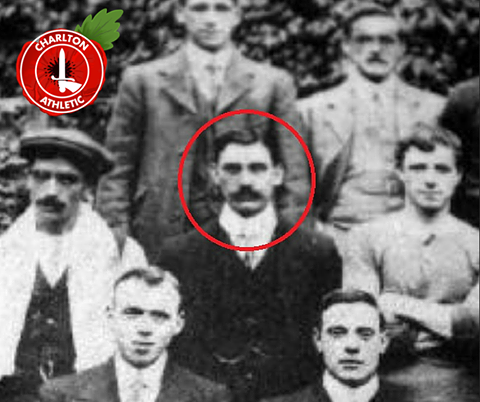 While we have no record of him playing he does appear in a named 1913/14 team photograph dressed as a trainer. We can’t know what the connection was that brought him to the Addicks given he lived in Camberwell but we know Charlton stalwart Scotty Kingsley was also in the optical lens business so this may have been the link. It was certainly a good time to be associated with Charlton as they rose to dominate local amateur football. The Addicks won 8 consecutive league titles from 1907 to 1914 as they rose through the Lewisham, Woolwich and Southern Suburban leagues to the London League Premier Division. In 1914 the club entered the FA Cup for the first time, a mark of their rapidly rising status. On the 28 November 1915, 15 months after the outbreak of World War 1, Fred married Florence Gordair at St Stephens Parish Church, Walworth. His trade is given as an optician and the happy couple moved into 75 Mann Street, Walworth. Shortly after, he enlisted into the army joining the 3/Queens Own Royal West Kent Hussars, service number 2311. At such distance, we can only speculate that the two events were connected, Fred wanting to marry his sweetheart before taking the King’s shilling perhaps. 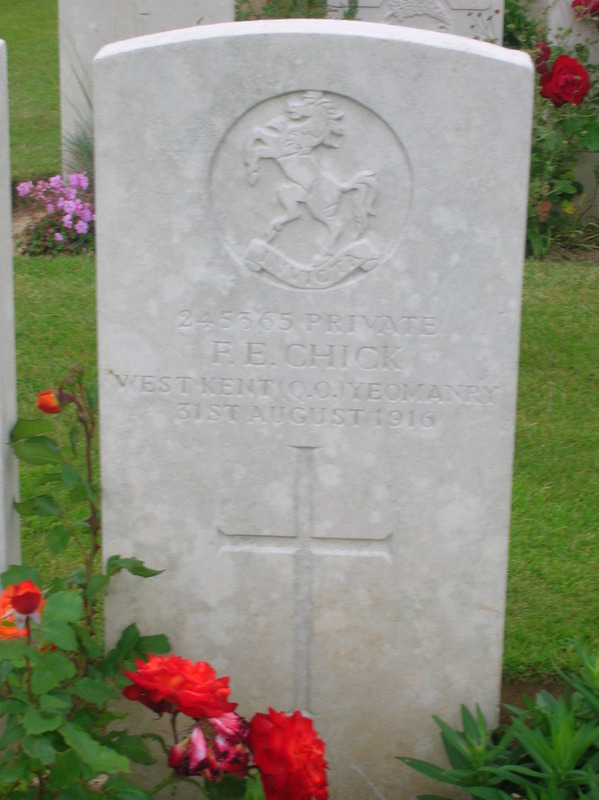 Chick’s unit did not serve in France but it appears that due to growing casualties in France he was part of a draft to France in the Summer of 1916 to await posting to an infantry battalion. In fact, the Queens Own Royal West Kent Hussars suffered just 23 men killed in France, 22 of the on the 31 August 1916 attached to the 13 Middlesex Regiment. 31 August 1916 – Trenches knee deep in mud and blocked by troops at 0830 enemy bombardment commenced on all trenches increasing until 1400 when an attack was launched. B Coy were driven out of Tea Trench whilst A Coy were pushed back to MacDougal Communication Trench and Pont Street. The enemy advanced to Orchard Street where they were stopped by 2/Lt Green and 12 men of D Coy with a Lewis Gun, they were forced to retire, this they did in good order holding up the enemy all the way until support could be brought up. Battalion withdrew to Carlton Street; gas shells fell throughout the night. For the month of August, the casualties for the battalion were 9 Officers killed, 17 wounded, Other Ranks, 88 killed, 146 missing, 328 wounded. Fred Chick being among them. Whilst his army service records appear not to have survived there is reference to him in the Army Register of Soldiers Effects that £2, 4shillings and tuppence (Approximately £2.21) were given to wife Florence in January 1918. Initially being posted as missing his body was recovered along with a comrade in the same unit at the end of the war from Grid reference 57C SW S11 A8.8. this location is north of Delville Wood towards High Wood, both were reinterred in Caterpillar Valley Cemetery just outside the village of Longueval and today lie side by side. His grave is regularly visited by Charlton fans touring the western front and wishing to pay their respects to an Addick who lost his life 100 years ago. What struck me was that it seems he was in only his second day in the front line when he was killed. I always try to make a point of visiting Fred's grave when I am on the Somme. By coincidence, On my first visit I noticed that there was another soldier called Chick buried in the same cemetery and the address given in the register was Salop Place, Penarth. My wife comes from Penarth and I knew that one of her friends at school was called Chick. I checked with her and at the time my wife knew the family they still lived at that address. The museum will be announcing details of our event to take place on Armed Forces Day v Port Vale on 17 November soon. We hope that as many fans as possible can join us.